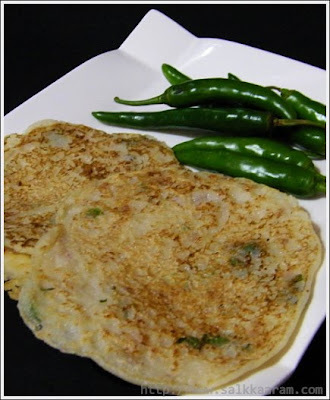 Rava Dosa / Semolina Pancakes | Simple and Delicious ! Tired of eating rava upma? 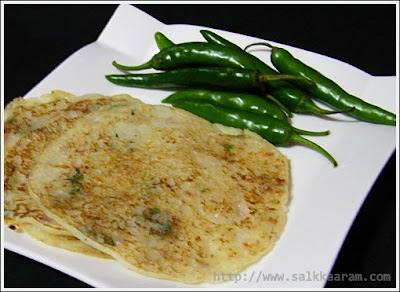 Then try out this simple rava dosa. I love all rava dishes here and this is another simple rava recipe added in the list. You can make this as a quick break fast dish or a spicy evening snack. It will be too good if you serve this with some ulli chutney or some spicy fish curry, enjoy! Heat tawa, apply little oil or ghee, pour 2 ladle ful of batter. Allow to spread slowly with the back of the ladle. Cook on a medium flame, flip over when one side is done. Cook other side too, serve hot with tea! My mom always makes rava dosas. I too love making it.It is so easy and healthy. Looks so so good, love it as one only has to keep them for half hour. I used to make rava dosa when i am out of dosa batter. As swapna said it's really easy and healthy. Nice recipe. It look's to good to be through I am definitely going to try this. Ahh, they look appetizing, it must go well with the vendakka sambar in the next post of yours. hi thank u for these great recipies. last week i tried 2 make rava dosa xatly in the way u said...but itz nt workin..
batter was toooo thick...then i added a little water...but still batter was stickin ovr the pan...dut knw watz wrong?